Find hotel near Tree Of Life Wildlife Cen ..
A haven for battered animals, animals rescued from injuries or were illegal pet and confiscated from the owners were all bought back to this institution to be nursed back to health and given an improved chance of survival in the wild. The Botanical Garden is not merely an ornamental garden, it is a safe house with a series of large cages which is home to the local fauna. Animals such as toucans, monkeys, coatimundi, deer, wild pigs, and peccaries have all found their realm in this garden where they get professional care under supervision. Apart from this, the centre also has breeding programmes for iguanas and turtles. This is not a zoo but a rescue centre for animals which were pets or wild animals which were injured. Some of these animals like being petted since they crave for the warmth of a human hand and nothing better to help them heal than tender love and care. The wild animals are prepared to readjust and survive and released into their natural environment. 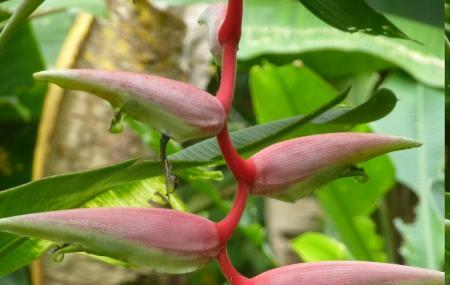 The lush gardens is rich with bromeliads, heliconias, palms, and the nursery under the canopy is packed with tropical plants which are ethno-botanical in nature. Ethno botanical plants are consumed by man such as the cinnamon and black pepper plants. The paved pathways lead to the pond which is teeming with koi and carp, the traditional Japanese symbol for Love and Friendship. A walk through the gardens takes you to the beach which has a unique black sand and it blends with the nature in the park. The infra-structure of the garden in designed to blend harmony with the needs of the animals under protection. In order to help children understand the importance and conservation of wildlife, the centre offers tours for school children. The tours provide the children with an in depth study of fauna and flora of the region. Do not attempt to touch or feed some of the animals since they belong in the wild. It is a non-profit organisation so donations are welcome. All the animals come from different backgrounds, so listen carefully on the tour. The entrance fees goes directly to help the animals. Some animals are old and feeble, blind or damaged beyond repair so the centre provides them with comfort, try to keep the environment noise free. Guided tour - USD 15. There are several buses departuring San Jose to Cahuita from 6AM till 4PM. There are additional buses between Puerto Limon and Sixaola which pass by Cahuita. From San José the cost is about $4 and from Limon about $1.50. How popular is Tree Of Life Wildlife Centre And Botanical Gardens? People normally club together Playa Negra and Gandoca Manzanillo National Wildlife Refuge while planning their visit to Tree Of Life Wildlife Centre And Botanical Gardens. People also prefer to start their day with Tree Of Life Wildlife Centre And Botanical Gardens.